Broad Ripple (15-20 minute trip) – If you’re looking for good restaurants and places to shop, downtown Broad Ripple is the place to be. To get there, take Route 18 and get off after about 7 stops at 63rd and College.  To get back to Butler, get on the bus at 49th and Boulevard. Downtown Indianapolis (30-minute trip) – Downtown Indianapolis is the place to be if you’re looking for shopping and good food. These directions will drop you off at Circle Center Mall in the heart of downtown Indy. To get there, hop on Route 18 and stay on for about 34 stops. Get off the bus at Maryland and Pennsylvania. 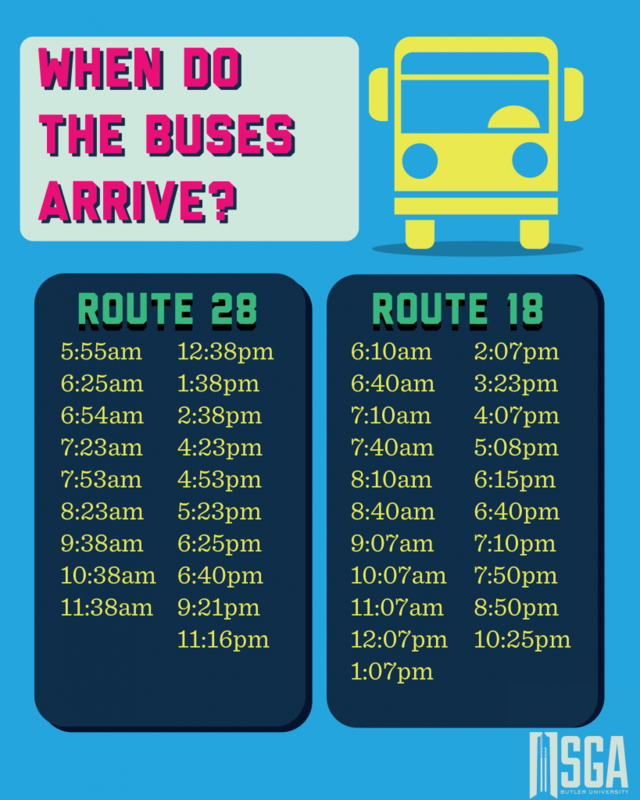 For directions and travel times for other locations, check out the IndyGo Trip Planner. Exact Change is required to purchase the pass from an Indygo station. College S-Pass: $30 and is valid for 30 days once scanned on an IndyGo bus. If you don’t have the exact change then you can go to the Student Involvement and Leadership Department and you can buy an Indy bus pass from them. 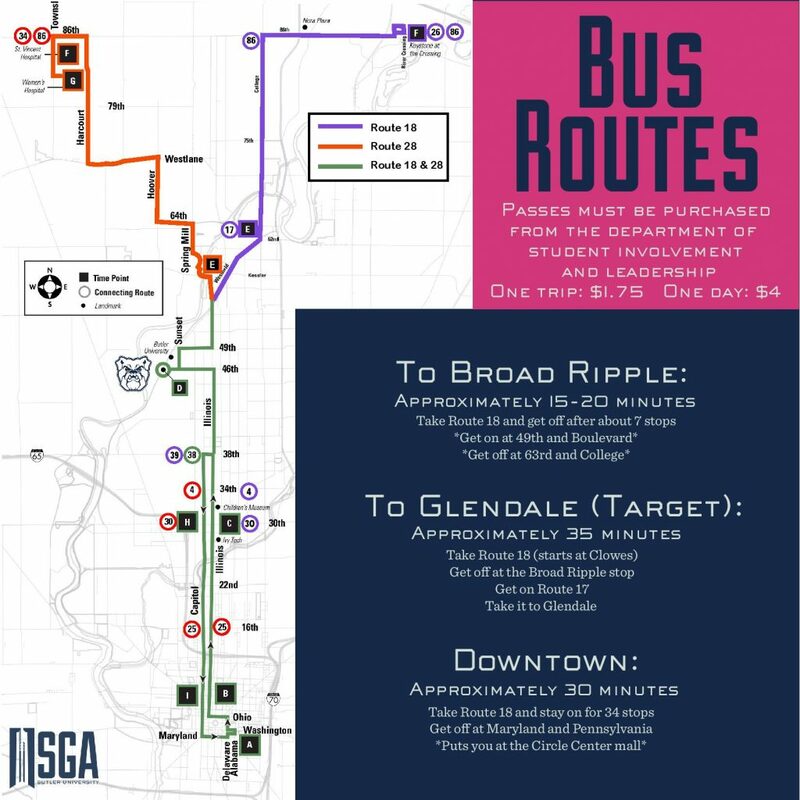 For full IndyGo Bus Routes, check out this pdf.